Our claim to fame is our unique collection of Guild Banners over 200 years old, including The Weavers', The Carpenters', The Shoemakers', and the spectacular banner of the Boyne Fishermen. The three Trades Banners are The Fishermen’s, The Brick & Stone Layers, & The Labourers. 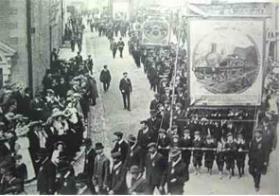 The Labourers Banner is thought to have belonged to a group of Agricultural Labourers. Industrialisation in the early nineteenth century drew Drogheda ever more firmly into the wider economy. A gas works was set up as early as 1832 and the Drogheda-Dublin railway connected the town to the capital in 1844. A large pool of skilled labour, especially weavers, became available, and many Belfast and British manufacturers established factories. By the 1850's five linen mills were in operation and local entrepreneurs had developed larger and more efficient units of production in numerous small industries. Drogheda has been an important port since the medieval period, and in the eighteenth century was a considerable centre for the linen industry of the surrounding area.